The Three Levels of Leadership Book - Development as a leader. The Three Levels of Leadership has had five-star reviews on both US Amazon and UK Amazon since the first edition’s release in 2011 because of its groundbreaking, practical, psychological approach to growing leaders. 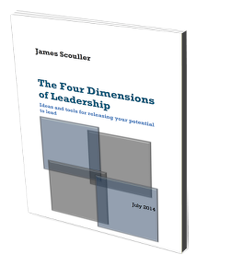 Now, in 2016, James Scouller has updated his classic text in an expanded second edition with new tips, tools and models on motivation, executive presence, how to lead change and how to apply the four-dimensional approach to leadership. For more detail on what’s new about the second edition, click here. This page explains who The Three Levels of Leadership is for, what it offers and why it’s unusual among the many leadership books available. It tells you about the book’s new ideas, its practical easy-to-read style, its downloadable tools and how it reveals the key to what Jim Collins called Level 5 Leadership in his book, Good to Great. The Three Levels of Leadership: How to Develop Your Leadership Presence, Knowhow and Skill (second edition) by James Scouller (ISBN 978185 2527716), published by Management Books 2000, August 2016. You can easily tell it apart from the first edition because it has a gold flash on the front cover saying "New enlarged edition". If you want to know how to buy either the print or e-book version, click the red Where to Buy button (top right of page). If you’d like to hear James Scouller introducing the book, click the video at the bottom of the page. Who is The Three Levels of Leadership for? Experienced leaders who want to be better at what they do and need a modern leadership manual to help them quicken their growth. People aspiring to level 5 leadership who want to work on what Jim Collins called the leader’s “inner development,” but don’t know how. Students confused by the differing leadership theories on offer who sense there must be a way of drawing them together in one “master” leadership model. Younger people starting out in their careers who want to grow their leadership knowhow and skill but also realise they need to develop their leadership presence and emotional intelligence (EQ). Leaders who want to apply the ideals of "servant leadership" and "authentic leadership" in action. What makes it an unusual leadership book? No other leadership book covers so much ground so clearly in so few pages. It’s the clearest, most complete, most concise and practical guide to leadership you’ll find. Compact; there is no padding. Every page matters. You won’t have to hunt for the useful stuff. Its section on motivation explains in only 15 pages what Dan Pink's book "Drive" takes 240 pages to cover. A new practical definition of leadership that not only makes a surprising difference, you can use it as a practical tool. A redefining of the leader’s purpose that accepts the unavoidable need to share leadership, while spelling out the one responsibility the leader can't give away. A model of leadership effectiveness that combines the best of the old theories while addressing their one big weakness: inattention to the leader’s psychology and presence. An analysis of the causes, benefits and seven qualities of "leadership presence" plus guidance on how to let your unique presence flow. A new model on how to lead organisational change – the Spiral-Waves model – that synthesieses all the thinking and research (Kotter, Gladwell, Shapiro and others) of the last 50 years. A breakthrough model of the mind, the first for 75 years, drawing on the latest thinking and research from psychology and neuroscience. Incorporates self-mastery – a previously overlooked key for growing your emotional intelligence (EQ), leadership presence, resilience, authenticity and flexibility. Practical science-backed techniques and tools for developing your self-mastery. Note: you can download some of the tools from this website by going to the Tool Downloads page. Lets you see your learning priorities clearly. Helps you figure out which leadership behaviours you need to work on first and understand the supporting knowhow and skills you need to learn. Turns the abstract ideals of "servant leadership" and "authentic leadership" into a practical reality. A new, practical four-dimensional definition of leadership. How to use the four-dimensional definition as a practical tool. See the What’s New page for more detail. The simple, but perhaps surprising purpose of a leader. A one-page summary of the many older leadership theories that try to explain the keys to a leader’s effectiveness. A brief look at the fatal flaws of these leadership theories. A new leadership model: The Three Levels of Leadership. A model that combines the old leadership theories while addressing the two issues they ignore: leadership presence and the leader’s psychology. Detail on the three levels: Public, Private and Personal Leadership. Public and Private leadership are the two behavioural levels – they are what you do around other people. Public Leadership is about influencing the attitudes and behaviour of several people at once. Private leadership is about one-to-one handling of group members. Personal leadership is about your technical and psychological self-development. It’s the key to developing your emotional intelligence (EQ), presence, resilience, knowhow and skill. It’s also the key to what Jim Collins called the “inner development” of a leader to Level 5 Leadership. Lists of the key public and private leadership behaviours. Two self-assessment exercises to help you decide which leadership behaviours to work on first. How the four dimensions and three levels of leadership connect. An explanation of what presence is, how it shows itself and how it’s different to charisma. The seven qualities of presence and how everyone can express their unique presence by practising self-mastery. Includes self-reflection questions to help you gauge how much of the seven qualities you are expressing today. See the What’s New page for more detail. The technical knowhow every leader needs and how to gain it with major new sections on motivation and the difficult art of leading organisational change, including the new Spiral-Waves change model. See the What’s New page for more detail. The skills that support the public and private leadership behaviours, what you can do to learn them and how they connect to emotional intelligence (EQ). A self-assessment exercise to help you see your technical knowledge and leadership skills learning priorities. Why the right attitude to other people is so important. A new model that explains what this attitude involves. Plus real-life examples. Why some leaders don’t display the right attitude and what you can do to avoid the same happening to you. The importance of vision. How it is different to mission. How to create a shared vision. How and why self-mastery develops the right attitude and behaviour towards others. A new model of the mind to support the practice of self-mastery – a model drawing on the latest thinking from psychology and neuroscience. The practice of self-mastery: the principles of personal change, the obstacles you are likely to meet and how to overcome them. Plus six practical techniques to help you work on self-mastery and, where necessary, scientific data to support them. Again, see the What’s New page for more detail. A final chapter summarising and tying together the book’s key themes so you can see the big picture having read the detail in previous chapters. 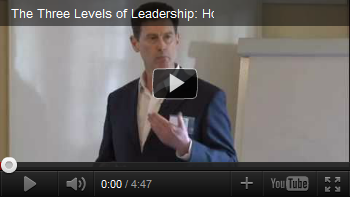 The Three Levels of Leadership is available in print form from online and high street retailers. It's also available on Kindle (and on Apple iPads using the Kindle app) from Amazon. Click the red Where to Buy button (top right of page) for more details. Just click the video below to hear the author introducing the book.